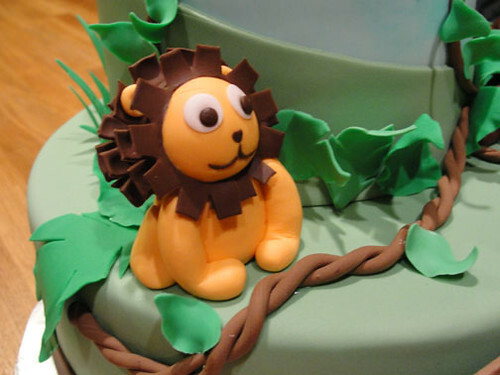 Cute Jungle Cake...hear me roar! There is nothing cuter than a jungle of cute baby animals... oh yes, there is! 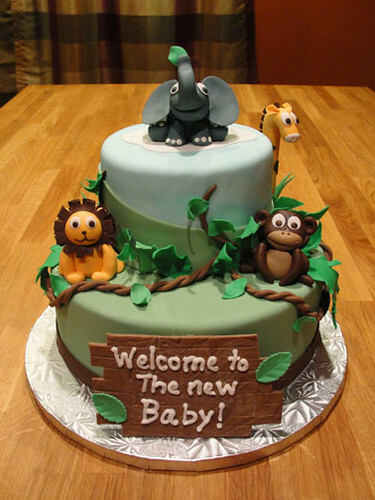 A jungle cake with darling baby animals awaiting a new friend to arrive! This baby shower cake was inspired by a photo that Wendy had sent me, and her only criteria was that the animals had to be cute. I think I can pull that off. This cake required some major time management and prepping. 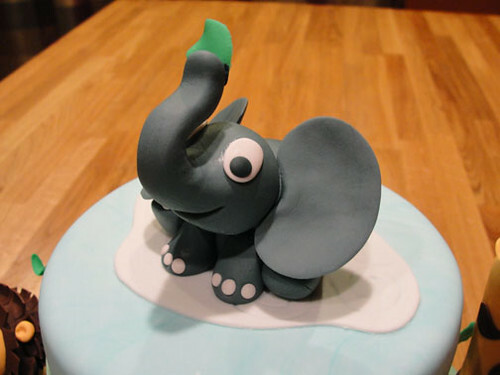 A week prior to delivery, I handmade a large amount of various leaves and grass out of a 50/50 gumpaste and fondant mixture. Making more than I needed ensured that I would have some on hand for any accidents that may occur. "Knock on wood!" I rolled out the green tinted mixture as thin as I could, and cut out different shapes of leaves. I then ran a ball tool over the outer edges of the leaves for a life-like movement. After completing the leaves, I combined tan colored gumpaste with a small amount of dark chocolate fondant. This was used to create the wooden message sign. I kneaded the two colors together, but not combining them completely to create the markings and swirls found in real wood. The mixture was then rolled out flat, imprinted with a plastic mold to create the planks of wood, and then trimmed. This piece had to dry completely before using, so a light dusting of confectionery sugar helps. Time for some baby animals! First, I kneaded a small amount of 50/50 in each color that I would need. Using an image of each animal, I hand-shaped each part of the cute little guys and assembled them with a touch of gum glue. The elephant's head was propped on some balled-up tissue until it set in place. Other details such as their signature tails were left to harden before I attached them because of their delicate thickness. The elephant's ears were left to dry in a shallow flower former to ensure that they wouldn't plop over. The giraffe was shaped around a bamboo skewer, and was left to harden with its head propped on a cup until stiffened. The small details of the animals' manes, paws, and large eyes add the special touch of cuteness that Wendy wanted for her friend. With the leaves and animals done, it was time to bake up the cute jungle home for them. This cake started with a 6" round vanilla cake filled with bavarian cream. After lightly icing the vanilla cake with a thin layer of buttercream, a blanket of marbled white and pale blue fondant was laid down. This looked like perfect a layer of clouds in a beautiful blue sky. 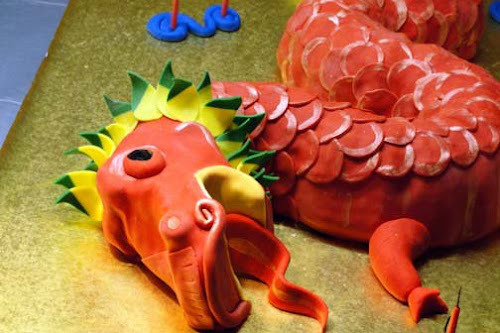 An asymmetrical strip of pale green fondant was wrapped around the bottom portion to represent grassy hills. The bottom portion was a 10" dark chocolate cake filled with chocolate bavarian cream. Having the option of two flavors is better than just one! I thinly iced the cake with buttercream and smoothed on a layer of the same green fondant used on the lower half of the 6" cake. The two cakes were then stacked on a half inch foil drum, but not centered. I offset the cake towards one edge to further the illusion of a hill. Once I was happy with the position of the cake, I ran a cake dowel down the two cakes and into the foil drum. Assembly is done and here comes the fun part! Time to decorate! I finished the bottom of the cake with a ribbon of chocolate fondant, and rolled some out into long ropes that I twisted together to create vines. 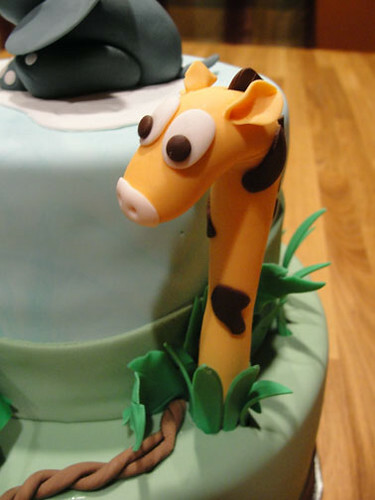 I placed each assembled animal onto the cake and secured each one with a brush of piping gel. The giraffe was inserted on the side, peeping out of a little bush. 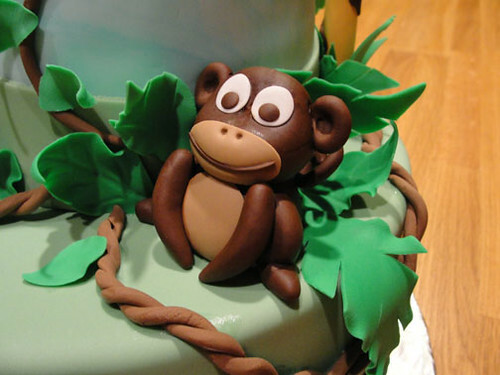 More leaves and grass blades were attached with piping gel to create the jungle scene. The elephant was the new baby, floating down from heaven on a cloud. I rolled out white fondant and ran a veining tool over it to create cloud-like swirls. The elephant was then attached on top. 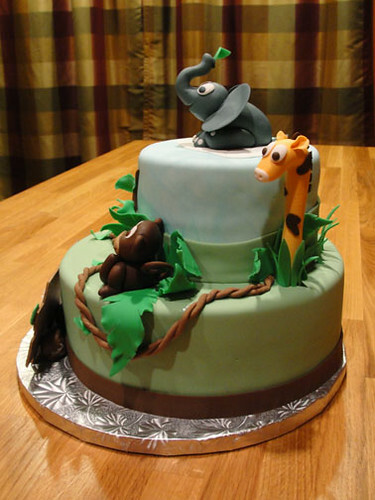 With the animals and leaves in place, I draped and wrapped the vines around the cake. 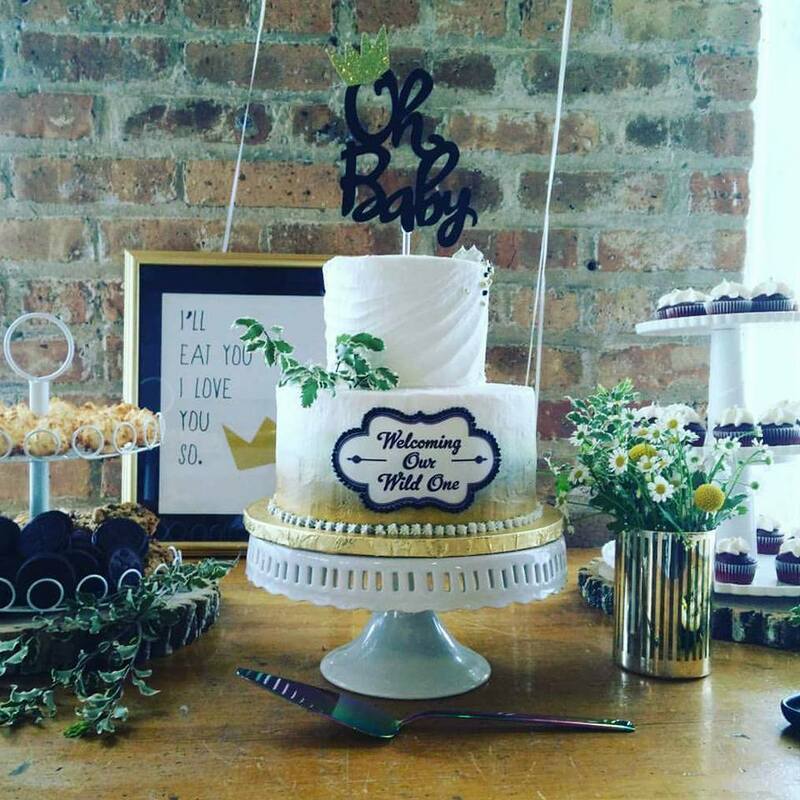 The final piece was the wooden sign that was propped in front of the cake, and a message was piped on with buttercream. Welcome to the world, Baby!